Welcome to the Spring 2018 issue of VAN. This issue is full of useful information including calls for papers and panels as well as conference announcements from across the country. For anyone still waiting to register for the upcoming VAF conference May 2-5, 2018 space is very limited, so don’t delay, register now! Members continue to share wonderful news of publications, lectures, and honors. Please send us your good news to share. The Spring bibliography highlights useful resources that span the disciplines that contribute to vernacular architecture studies. Thanks as always for the contributions to the newsletter, please keep them coming! VAF has always been fortunate to have careful financial stewardship and the support of its members. In recent years, our traditionally modest means have been transformed into a position of fiscal strength, due to the support of an extremely generous anonymous donor. Just this spring VAF received another $100,000 donation, the eighth from this amazing benefactor. Several years of well-attended and well-run conferences have also contributed to our financial health. The VAF Board, as guided by the Finance Committee, has instituted an Investment Policy Statement with the primary objective of “preserving the long-term, real purchasing power of our assets while providing a relatively predictable and growing stream of annual distributions in support of the VAF operating budget.” In plain language, we want to maintain our nest egg for the future while increasing Board spending in key areas such as student support, conferences, and fieldwork. Currently VAF’s assets are placed in several Vanguard index funds. Starting with VAF’s 2017 budget, 4.5% of the net value of assets, averaged over the previous twelve quarters, is distributed to the operating budget. For the 2018 budget, this added $31,750 of income to a total operating budget of $106,740. The new income stream has allowed VAF to expand its operating budget in important ways. Because VAF conferences are the heart of our organization, our operating budget now includes additional financial support for conference fieldwork and for conference planning services. VAF has also increased the pool of funding for the Ambassador Awards and Simpson Presenter Awards. In recognition of the success of the 2016 Durham conference, VAF made donations to Mendenhall Homeplace and Preservation Durham to support their ongoing work. Similarly, Preservation Utah received a donation after the 2017 Utah conference to create a “VAF Legacy Program” promoting field documentation through workshops for local partners. Beyond conferences, initiatives such as the Orlando Ridout V Fieldwork Fellowship, the VAF special book series with University of Tennessee Press, and Buildings & Landscapes have received budget increases. Members with questions about the details of VAF’s operating budget, investment accounts, or any other financial matters are welcome to contact me (treasurer@vafweb.org). Check out the newest section of the VAF website, under the Learning tab drop down menu are announcements for Field Schools. This new website section will be updated on a regular basis to keep the information fresh. Buildings-Landscapes-Cultures Field School, University of Wisconsin-Milwaukee. The Montana Preservation Alliance (MPA) in partnership with the USDA Forest Service Region 1 is excited to announce the next Montana Preservation Road Show, a touring historic preservation conference to be held June 13-16 at Cedar Creek Lodge in Columbia Falls and around the Flathead/Glacier region. The Road Show launches from a different small town every other year with the mission to immerse participants in the history and culture of rural Montana, spotlight great local preservation efforts, and raise awareness of the importance of preserving Montana’s historic buildings and cultural landscapes. In the Flathead, that means taking the path less traveled to see barns and homesteads, tribal landscapes, industrial buildings, ranger stations, depots, hotels, and more. Along the way, veteran preservationists, local historians, tribal experts, archaeologists, teachers and professors all join in to provide a well-rounded portrait of the historic places that define the Flathead area and her people. You don’t have to be an historian or professional preservationist to join this conference – just an enthusiastic traveler, listener, and lover of history. The hardest part of the Road Show is choosing from several concurrent tour and/or talk options during the four days. “The Flathead has such a wealth of architecture, history, and cultural sites to learn about, we’ve really had a hard time narrowing down all the choices to fit into four days,” says Brown. “It will be a tough decision for a lot of folks to choose which all-day and half-day tours they want to take.” For those who can’t attend the full conference, tours on Saturday offer a one-day registration fee. Explore the North Fork Road and its history on a trip to Big Creek Work Center, Polebridge, and other North Fork landmarks with local historians and the Flathead National Forest archaeologist. 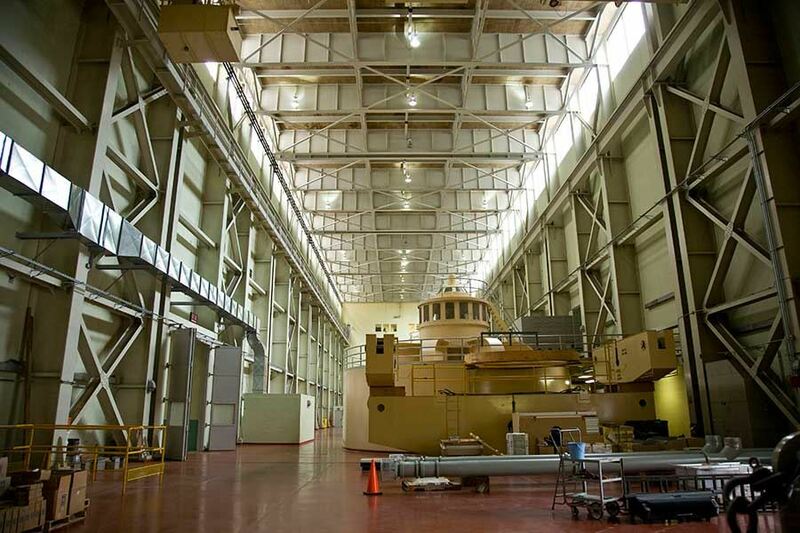 Discover post-World War II industrial architecture at Hungry Horse Dam, and at the ruins of the Columbia Falls Aluminum Company plant with local and national experts. Choose a Saturday tour to learn about Salish-Kootenai history and culture; Spotted Bear Ranger District history; or Lower Valley historic barns. Conference participants are encouraged to book hotel reservations as early as possible due to high demand for rooms near Glacier National Park. Road Show conference headquarters will be at the Cedar Creek Lodge in Columbia Falls with block room rates starting at $179/night until April 14. MPA also has room blocks reserved until May 13 at Belton Chalet in West Glacier (starting at $140/night); Glacier Highland Motel in West Glacier (starting at $105/night until); and the West Glacier Motel (starting at $99/night). Online registration for the conference will open on February 5. Registration is $200 for members or $225 for non-members and includes a reception on June 13; all-day tour, lunch, and evening presentation on June 14; and talks, lunch, and half-day tour on June 15. Tours on June 16 are optional/a-la-carte and cost $50 to $100 each. MPA is proud to announce that the Road Show is supported for the next three years by a major grant from the National Endowment for the Humanities: Exploring the human endeavor. Since 2012, our award-winning conference has blazed new pathways with the USDA Forest Service Region 1, Bureau of Land Management, Montana State Parks, Montana History Foundation, Humanities Montana, Bureau of Reclamation, local museums and businesses to offer a traveling preservation conference that transports participants to lesser known, rural historic sites, many of which have been saved through National Historic Preservation Act activities. To get the latest information, updates, and registration information about the Road Show, visit PreserveMontana.org/2018-Road-Show or follow Montana Preservation Alliance on Facebook. For further information, to request high resolution photos and logos, or to become a Road Show sponsor, please email Christine@preservemontana.org. This summer and fall, the Department of Historic Preservation will be offering the largest selection of distance learning courses since initiating the online Graduate Certificate in Historic Preservation in 2016. Additional information about the certificate program and individual courses can be found on the Online Graduate Certificate in Historic Preservation webpage. We are particularly excited to announce the intensive week-long field school portion of HP 676 Field Methods in Heritage Conservation, one of our hybrid courses, will be based this summer at the Pine Mountain Settlement School, a National Historic Landmark located in the heart of the Appalachian Coalfields. Frequently asked questions about the Field School, as well as information about how to apply for a limited number of partial tuition scholarships, can be found on the Field School in Heritage Documentation webpage . Stenton Museum, the McNeil Center for Early American Studies, the Program in Early American Economy and Society at the Library Company of Philadelphia, Cliveden of the National Trust, and the Graduate Program in Historic Preservation at the University of Pennsylvania invite your participation in a two-and-a half-day conference exploring the creation and development of plantations in the eighteenth- and nineteenth-century mid-Atlantic region. A real-world challenge to Thomas Jefferson’s vision of an agrarian republic of (white) smallholders, plantations were sites of concentrated wealth and exploitation. More familiar in a Southern context, mid-Atlantic plantations had their own forms, meanings, and relationships. In the mid-Atlantic – where fertile farmland and deep-water ports provided complementary economic engines – plantations grew in close proximity to urban centers, Northern and Southern interests co-mingled, and boundaries frequently blurred. This conference seeks to understand the unique qualities of plantation complexes in the middle colonies (states) while also comparing these regional phenomena with better-known Southern institutions and situating them within the larger contexts of British North America and the United States. 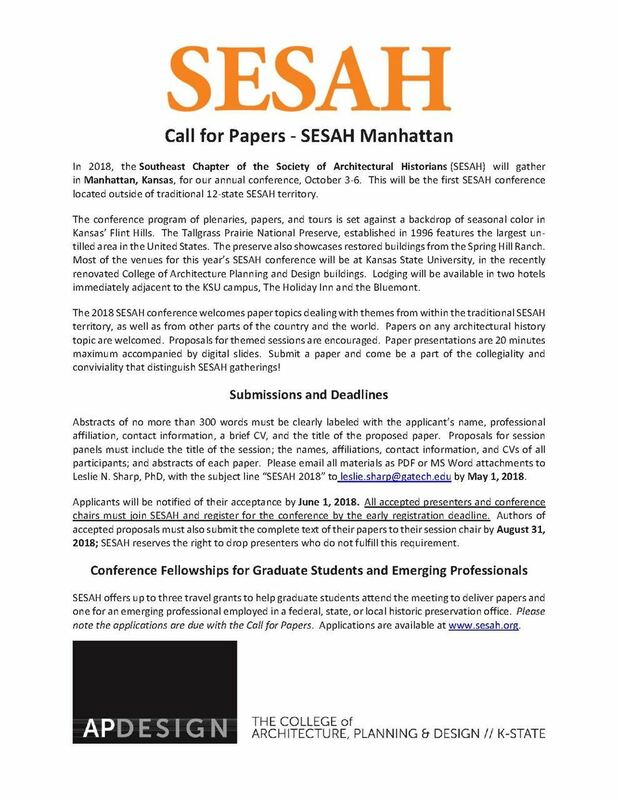 If you wish to propose a paper or presentation, please submit an abstract (250 words) and a short curriculum vitae to mceas@ccat.sas.upenn.edu. Proposals for panels should include these materials for each participant, as well as a brief description of the overarching concerns of the panel. The deadline for submissions is 15 September 2018. Applicants can expect to hear back from the conference committee by November 2018. Formal papers will be pre-circulated by September 2019. Some funding is available to offset the costs of travel and lodging for conference participants. Details about this support will be available after submissions are reviewed. VAF Member Amber Wiley gave a lecture at the National Building Museum on April 3 titled “The People of the Pilot District Project” as part of their new exhibit which opened March 31 titled “Community Policing in the Nation’s Capital: The Pilot District Project, 1968-1973."